The Problem: Unpleasant odors in hotel rooms left over after guests check out create bad reviews on social media sites and an unpleasant experience for the next guest. Residual smoke odor from cannabis and cigarettes, as well as odors from leftover food, body odors and general unpleasant air quality, result in lost revenue and increased room unavailability for the hotel due to extensive cleaning and restoration. The hospitality sector relies on great guest experiences at their hotels and resorts for referrals and return customers. The Solution: The WAXIE Dry Vapor Smoke & Odor Eliminator will thoroughly and completely eliminate ALL odors from the room eliminating the need for extensive down time for cleaning and restoration. 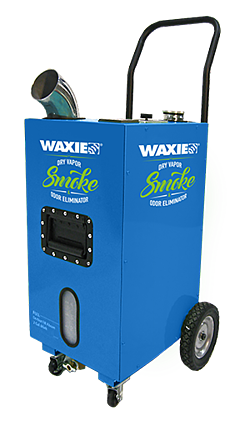 The WAXIE Dry Vapor & Odor Eliminator provides a dry dispersion system for its product. Safe to use – the room does not have to be vacated during use of the product. It eliminates ALL broad spectrum odors such as smoke, cannabis smell, mildew, accident scene odors, dead animals, rodents, skunk, feces, urine, vomit and many more. The machine itself is easy to move within a hotel between rooms or around a job site. It’s equipped with casters for maneuverability and side handles for ease of lifting in or out of a vehicle. It’s easy to use! Just fill up the reservoir with up to 2 gallons of WAXIE Solution Station® 640 Smoke Away Natural Odor Eliminator chemical and turn on – it automatically dispenses micron sized particles that start to work immediately. Unlike an ozone generator, there is no need to vacate the premises as it’s safe to use around people. How Does the WAXIE Dry Vapor Smoke & Odor Eliminator work? The WAXIE Solution Station 640 Smoke Away Natural Odor Eliminator chemical doesn’t mask odors but rather bonds to and eliminates odor molecules while they are still in the air, as well as those odor molecules that have penetrated fabrics, carpeting and other surfaces that can harbor odors. WAXIE Solution Station 640 Smoke Away Natural Odor Eliminator has been developed to be used in conjunction with the WAXIE Dry Vapor Smoke & Odor Eliminator to completely and effectively eliminate all odors and leave the premises with a clean and fresh scent. The WAXIE Solution Station 640 Smoke Away Natural Odor Eliminator is great for use in any commercial environment wherever odors are a problem.